WA CLEAN vaša ekskluzivna merilna naprava. Tehnologija, razvita s strani W Abrasives, služi aplikacijam, ki so povezane s projekti priprave površin pri procesu peskanja. 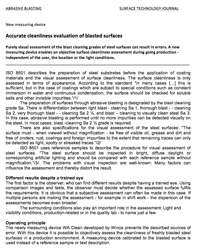 Purely visual assessment of the blast cleaning grades of steel surfaces can result in errors. A new measuring device enables an objective surface cleanliness assessment during going production - independent of the user, the location or the light conditions.